The longer I live in France, the more I find that the things that once drove me crazy about French people are precisely the things I find humorous about them now. You might have already noticed, especially in Paris, that the word jeans is often spelled with a pesky apostrophe: jean’s. So I couldn’t help laughing one day when I sat behind this guy on the bus whose label blatantly flounced all notions of correct apostrophe usage in English. Taking the man’s jacket label literally, and deliberately ignoring the fact that Jean-Paul Gaultier is a famous designer, would mean that Paul Gaultier belongs to a person named Jean, I suppose. But who would take this literally, or in the first degree, as the French call it? An anglophone apostrophe nut? Guilty as charged. So why does this label make me laugh now instead of simply perturbing my sense of propriety concerning apostrophe usage? I think I’ve finally started to understand what the French call second degree humor. Maybe it’s just me, but I find it pretty funny that even a famous designer could use this very French sense of irony right on his jacket’s label, when even the label itself is a play on words between the designer’s first name and his line of jean’s jeans. Not terrible, or pas terrible? Americans are often accused in French culture of taking thing too literally, at face value – first degree. But how do you actually use second degree humor? One expression we use in the second degree is Ce n’est pas terrible or more often, it’s pronounced without the ne: C’est pas terrible. Literally, this means something’s not terrible, not bad. But seen through the second degree lens, it’s not terrific, meaning it’s actually, truly terrible. People I know usually scrunch up their nose as they pronounce this expression, to show their dislike of whatever is pas terrible. There are plenty of other really great examples of French second-degree expressions, which you can find in books on French life, like The Parisians, by Alain Schifres. Well okay, so what if the French misuse English-language words and apostrophes? Maybe they think that using one will confer a sense of anglo “cool” on their brands, businesses, and other official names. But wait a minute… Don’t we also use French words to confer more panache or more cachet (hmmm…) to a product? Take scallops for example. When did they become "St. Jacques" on American menus? Or "en croute" – why not just say in a pastry or a salt crust? Another example is velouté: it literally means something velvety, and in classic French cuisine refers to one of the five mother sauces. But it’s also used nowadays for any puréed, creamed soup. Does velouté look better on a menu than puréed, creamed soup? You bet. There’s one word that I see almost universally misused on menus, no matter where I am: Chantilly. The word Chantilly is considered an appellation, or official name, and as far as classic French cuisine is concerned it means one thing, and one thing only: whipped cream with the addition of powdered or confectioner’s sugar, and vanilla bean. But this term has been largely hijacked and transformed to refer to savory whipped creams, which are a delicately pretty and delicious addition to soups or little aperitif toasts, like this recipe for Chantilly salée citron fines herbes. Or the herb Chantilly that accompanies the soup recipe below. And frankly, doesn’t Chantilly [shan tee yee] sound so much nicer than whipped cream? This week’s soup recipe comes not from Jean-Paul Gaultier, but from my friend Jean. His affinity for the seasonal soup recipe below could be explained by his love of monochromatic mid-century objects. The color? 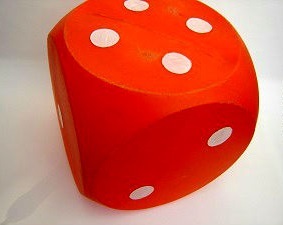 You guessed it: orange. Jean has transformed his adventures in finding orange objects into an art form: in and around Paris, he scours junk shops, flea markets, and vide-greniers (literally attic-emptyings, what we call yard sales). His sole aim is to unearth inexpensive portable vinyl record players called mange-discs, bubble chairs, plastic dice, bar kits, lampshades, and the occasional Eiffel DSW chair, by American designing couple Charles and Ray Eames. You can imagine why this is Jean’s favorite soup: its gorgeous orange color. It announces autumn just as surely as that first snap of pleasant cold that grabs my gut (or is that a hunger pang?) on the way to the market. When I get there, I buy the small round variety of pumpkin known as potimarron, a mix of the two words potiron (pumpkin) and marron or chestnut. Its flesh is sweet and dense with starch, and tastes a little like chestnuts, hence the name. In English, the pumpkin is called Hokkaido or Red kuri squash. I’ve dressed up this recipe with the addition of chestnuts, a very French ingredient, a bit of Cointreau (or use any orange-flavored liqueur), and yes, an herb Chantilly. These ingredients make this soup perfect for autumn dinner parties or even a festive fall occasion like Thanksgiving! And what’s great about most forms of pumpkin is that they’re economical vegetables – a helluva lot more affordable than an Eames chair! 1. In a large soup pot, melt the butter over medium heat. 2. Add the leeks and carrots and sauté until slightly caramelized (light brown-colored), about 5-7 minutes, stirring from time to time. 3. If you’re making the herb Chantilly, put a medium bowl and a hand whisk or beaters in the refrigerator to make sure they’re extra-cold. 4. Add the pumpkin cubes and stir well, and let cook about 3 minutes more. 5. Add water or stock, and bring to the boil. 6. Lower the heat and let the soup simmer, partially covered, for 15-20 minutes. Skim and throw away any foam that rises to the surface. 7. Reserve 4 chestnuts. Add the others to the soup, and continue to simmer about 10 more minutes. 8. Remove from heat and add the orange juice and Cointreau. Let the soup cool for about 10 minutes. 9. Using an immersion blender, purée the soup until it is smooth. If your pumpkin was on the heavy/big side, this purée will be too thick, so feel free to thin it with water or stock. 10. If you are making the herb Chantilly, whip the cream to medium peaks using a whisk or hand-held beater. You don’t want to over-whip, but it’s important to find the texture that will support the weight of the chopped chestnut garnish. 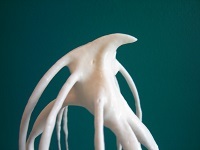 When you quickly lift the whisk from the cream, it should make what we call a bec d’oiseau, or bird’s beak (see photo). 11. Gently fold the herbs into the whipped cream using a rubber spatula. 12. Reheat the soup gently over low heat, and stir in the optional crème fraîche. The soup should be warmed through, but not boiling. 13. Chop the reserved chestnuts. 14. Taste the soup for seasoning and texture. Serve it as thick or as thin as you like. 15. Serve the soup right away in shallow bowls for a first course, or deep bowls if you’re dining light on just this warming soup and a few slices of toasted whole-grain bread. 16. If you made the herb Chantilly, make a little oblong quenelle (or dumpling) by using two tablespoons to shape the quenelle, and place it on the soup. Or just drop a dollop of cream on top, and then sprinkle a bit of chopped chestnuts on top of the cream. note: Preparing pumpkin isn’t as hard as it seems, although I’ll admit peeling the hard outer rind can seem intimidating. Did you know that you don’t even have to peel this small pumpkin? Start by cutting the entire pumpkin in half down the middle, using a large chef’s knife, and rather than sawing, don’t hesitate to remove the knife, turn the pumpkin a quarter turn, and make a cut further along that will eventually join the first one in the middle. Keep your hand flat on the top of the chef’s knife. Once you’ve got two halves, remove the stringy insides and seeds, and place one half flat on the cutting board. Then…. 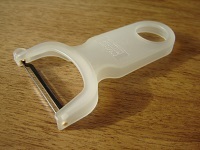 Use a Y-peeler (see photo) to peel the rind away. Easy! Use a serrated (bread) knife to cut away the rind, cutting always away from you and downwards, turning the pumpkin half as you go. The only tricky part is the top of the demi-sphere, but just keep the knife pointed away from you and cut nearly horizontally.